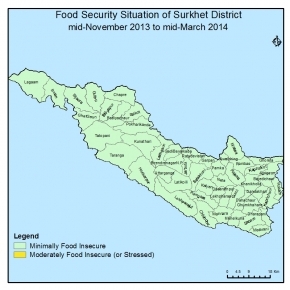 All the VDCs (50 VDCs and 1 Municipality) of the district is minimal food insecure during this monitoring cycle(July to November, 2013). The crop of paddy,maize and millet across the district have been harvested which has supported to more about 80% of household to food stock for more than 4 month. The production of other agricultural product (Green vegetables, Potatos) was normal. Above 1.24 million NPR was earned from sale of agri product and 1400 HH were involved on that process. Likewise 18000 HH ware on the revene of livestock and livestock product and sale and total revenue was more than 1 Billion during July - Oct. Similarly the population of 23197 have been earned 100 Billion NPR from the remittance. No natural disasters; no epidemic; tradional coping mechanism; generally peaceful situation was observed during this monitoring period.